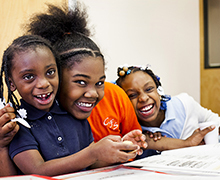 We believe that after school programs not only keep students safe, but support academic progress. Studies by the U.S. Department of Education show a strong correlation between academic gains and after school programs in districts that provide them. At the CamdenForward School, educational support and engagement does not end with the school day. We also provide a safe and nurturing after school program, allowing time for rest, snacks, homework help and exercise, as well as special trips and events. The CFS AfterSchool Care Program offers a wide range of activities so there is something to interest every student. Not only is this service a convenience to CFS families, it is a comfort for them to know that their children are loved and cared for. In addition, we operate six additional afterschool programs (ASPs) throughout the city of Camden, providing enrichment, homework help and opportunities for scholastic growth and friendship outside the boundaries of the classroom and school day. ASPs currently serve East Camden, North Camden, Waterfront South/Centerville/Morgan Village, and the Bergen/Lanning Square neighborhoods. These programs are open to all UP students and if space is available to other children who live in the neighborhood. At the CamdenForward School, we strive to provide a safe and nurturing after care environment, allowing time for rest, snacks, homework and exercise, as well as special trips and events. The CFS AfterSchool Care Program offers a wide range of activities so there is something to interest every student. Not only is this service a convenience to CFS families, it is a comfort for them to know their children are loved and cared for. We have a limited number of spaces in our AfterSchool Program; students are accepted on a first-come first-served basis. 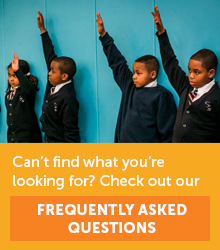 The AfterSchool Program is only available to students who are enrolled in the CamdenForward School. 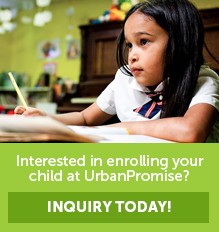 Interested parents should contact Pauline Murfree at (856) 661-1700 #1010 or pmurfree@urbanpromiseusa.org. 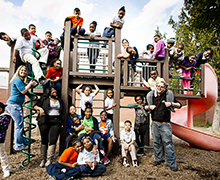 UrbanPromise operates six afterschool programs (ASPs) serving the East Camden, North Camden, Waterfront South/Centerville/Morgan Village, and Bergen/Lanning Square neighborhoods. These programs are open, on a space available basis, to children who live in each neighborhood. Preferential treatment in admissions is given to children who participate in other UP programs. ASPs operate most Mondays to Thursdays from mid-September to late May and are free of charge. In addition to daily homework time and snack time, participants engage in a wide variety of enrichment activities.Transportation is provided from selected local schools at the start of the program. Transportation home is also provided for children who live in the neighborhood. Registration and Fees: There is no fee. Interested parents should contact Geneva McDowell at (856) 382-1866 or gmcdowell@urbanpromiseusa.org. 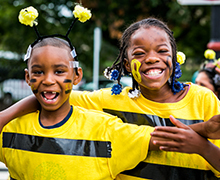 UrbanPromise operates eight summer camps serving the East Camden, North Camden, East Cramer Hill, Waterfront South/Centerville/Morgan Village, and Bergen/Lanning Square neighborhoods. Summer camps run for six weeks, Monday to Friday, 9am to mid-afternoon, from early July to the second week of August. Breakfast and lunch is provided. Transportation is not provided to most camp locations but staff will walk home kids who live within a few blocks of the camp site at the end of the camp day. Campers participate in a wide range of fun, recreation, and enrichment activities and weekly trips. There is a minimal registration fee to help cover the cost of trips. nterested parents should contact Geneva McDowell at (856) 382-1866 or gmcdowell@urbanpromiseusa.org. Since 1994, the StreetLeader program has employed local teens and provided leadership development, educational support, and college preparation for Camden area teens. Approximately 100 teens are employed each year through the StreetLeader program. During the summer, StreetLeaders work in the summer camps and participate in enrichment activities in the afternoon. 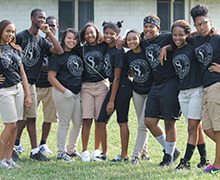 In the school year, StreetLeaders work in the afterschool programs and participate in afternoon and evening enrichment activities. Interested teens should contact Ronda Wagner at rwagner@urbanpromiseusa.org.